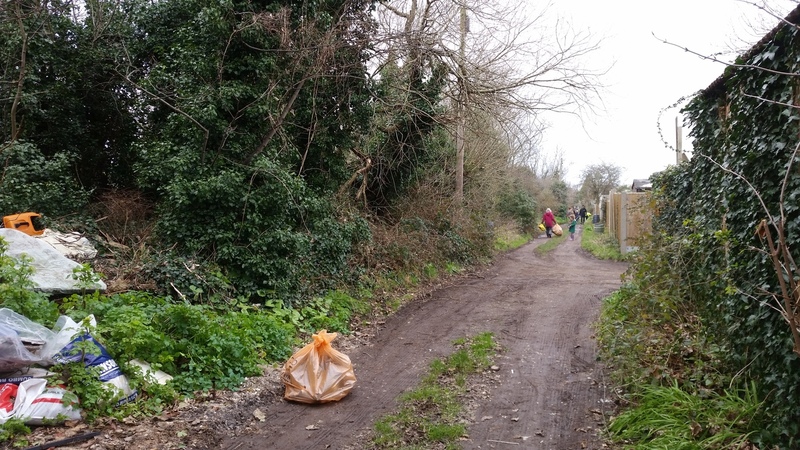 The Crab and Winkle Line Trust and Local Residents carried out a clear-up of the old railway embankment in Whitstable on the weekend of 2nd March 2019. About 20 bags of rubbish, a shopping trolley and tyre. Thank you to all involved. The Crab and Winkle Line Trust in partnership with Canterbury City Council will be holding an exhibition of proposals for two new bridges in Whitstable as part of the extension of the Crab and Winkle footpath and cycleway. Come to St. Peters Hall, 154 Cromwell Road, Whitstable on Friday 22nd and Saturday 23rd June between 1pm and 5pm to find out more. 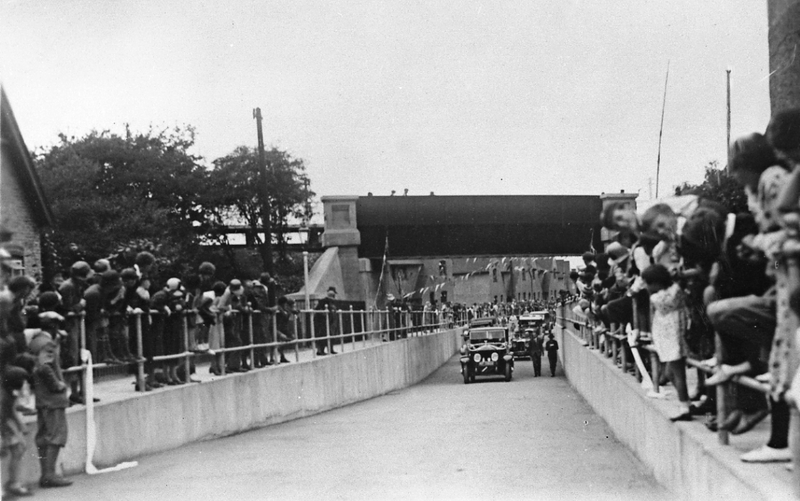 The scheme will include a new bridge over Teynham Road similar to the original bridge that carried the world’s first passenger steam railway. We are also proposing a bridge over Old Bridge Road and the railway so that the path can extend all the way to The Sidings and on towards the Harbour. The finished path will be accessible and street lit on winter evenings. The proposed new bridges are lower than previous designs that were given Planning Permission in 2011. New Planning Permission will be sought later this year but before then the Trust would like to show you our plans and hear your views. 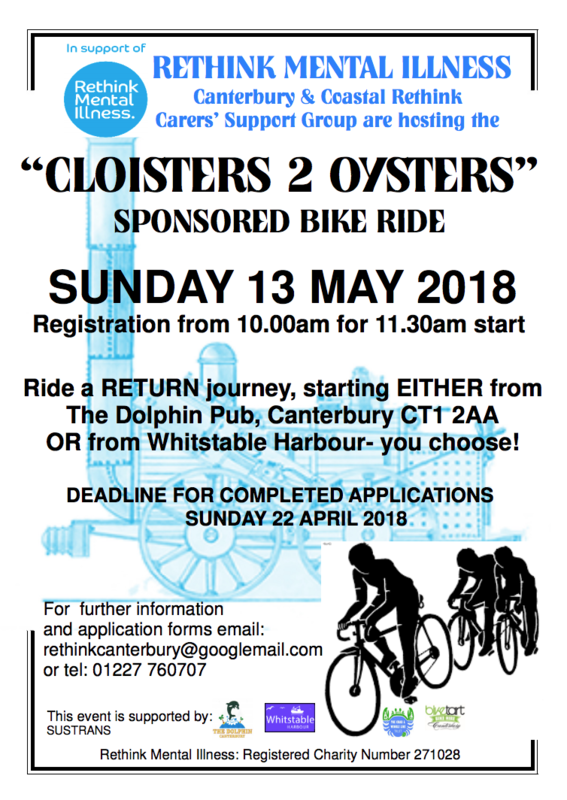 The Crab and Winkle Trust are proud to be supporting the “Cloisters to Oysters” sponsored bike ride which will go along the Crab and Winkle Way from Canterbury to Whitstable and back on Sunday the 20th of August. Would you like to take part or help marshal at the event?Please see details below. Please download and share a pdf copy of the poster: PDF Poster, or feel free to share the image below. 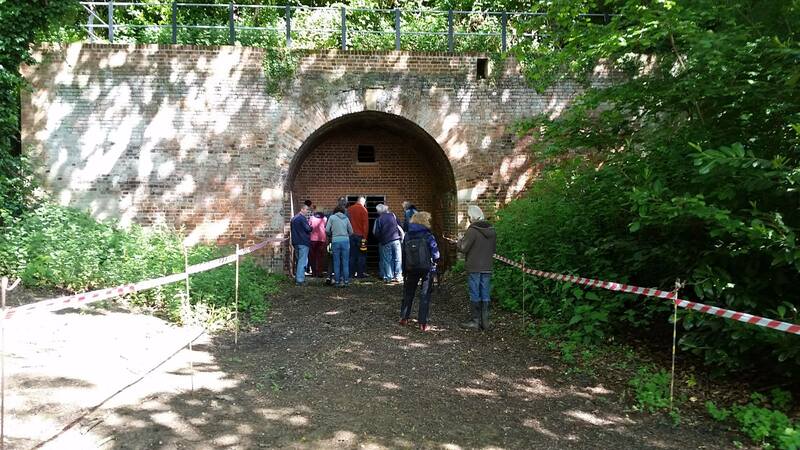 On May 20th, with kind permission from the land owner Paul Roberts and escorted by Shirley Thomson of the Kent Bat Group we took a group of people inside the disused tunnel that runs underneath what is now the University of Kent at Canterbury. 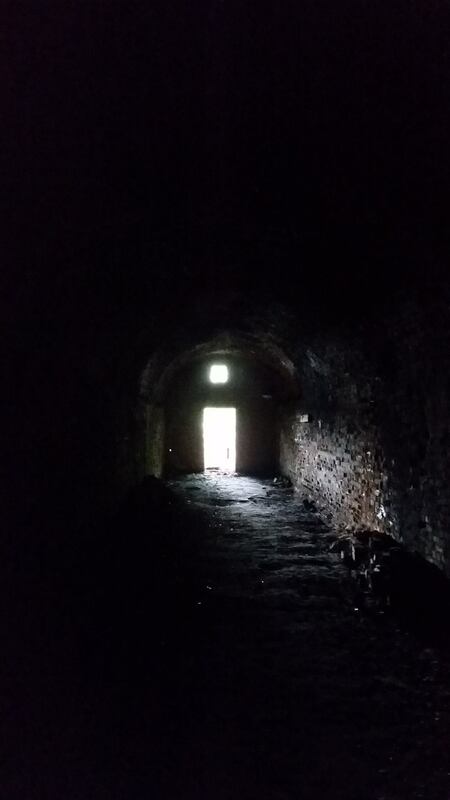 Work started on the tunnel in 1825. 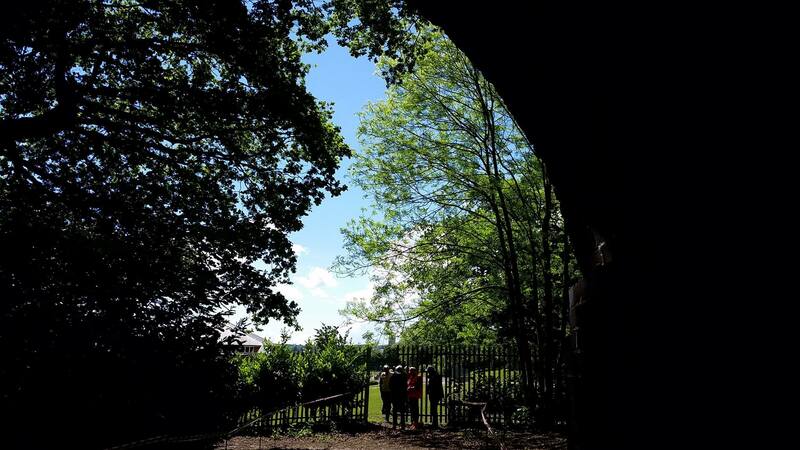 It is the oldest purpose built passenger railway tunnel in the world and is now grade 1 star listed. 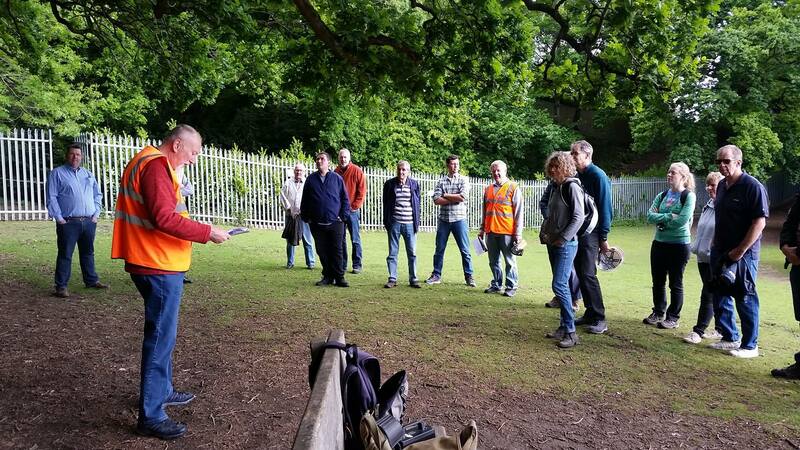 Its current owner has invested a lot of time and money in restoring some of the brickwork, clearing the site (along with trust volunteers), and protecting it from vandalism. It is now the perfect home for bats so we are only allowed to visit at certain times of the year escorted by someone with a bat license. To find out more about bats please go to the Kent Bat Group website http://www.kentbatgroup.org.uk/. John introducing the tunnel visit. 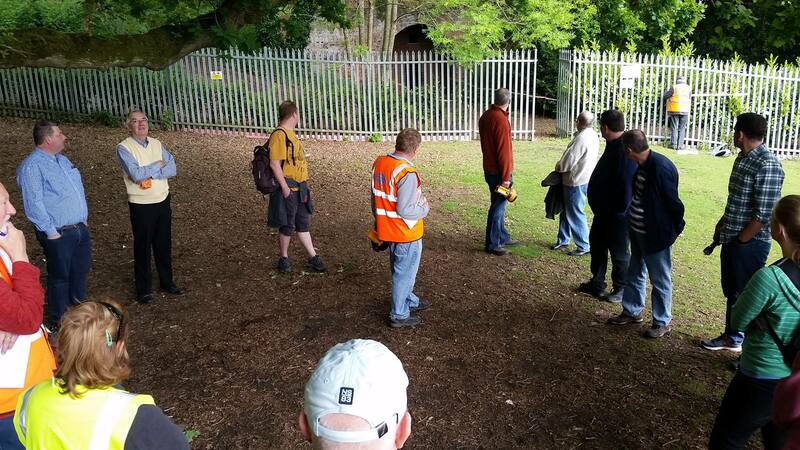 Trustee Jonathan Baker giving a talk about the history of the tunnel. 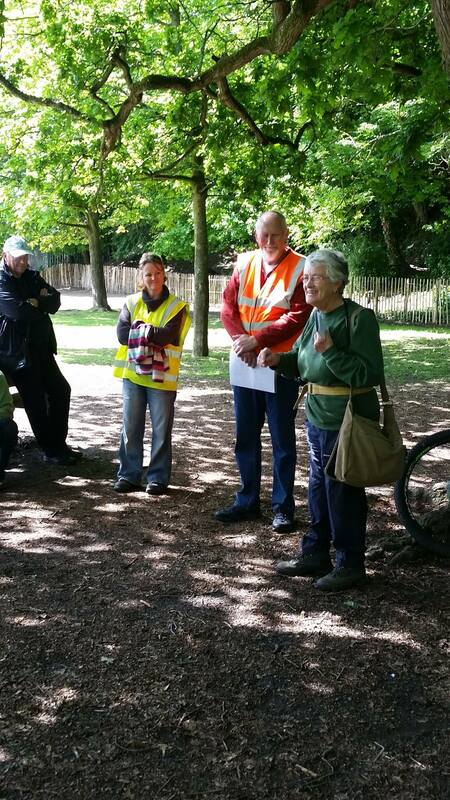 Shirley Thomson from East Kent Bat Group talking about the bats that now call the tunnel home. Looking out from the Tyler Hill Tunnel South Portal towards Canterbury. Visitors about to enter the Crab and Winkle Line Tyler Hill Tunnel South Portal. Inside the Tyler Hill Tunnel on the Crab and Winkle Line. The Crab and Winkle Trust announces Canterbury City Council funding to work on the Crab and Winkle Way in Whitstable. Following a decision by its Regeneration and Property Committee, Canterbury City Council has allocated £150,140 of Section 106 money to start work on the extension of the Crab and Winkle Way in Whitstable. 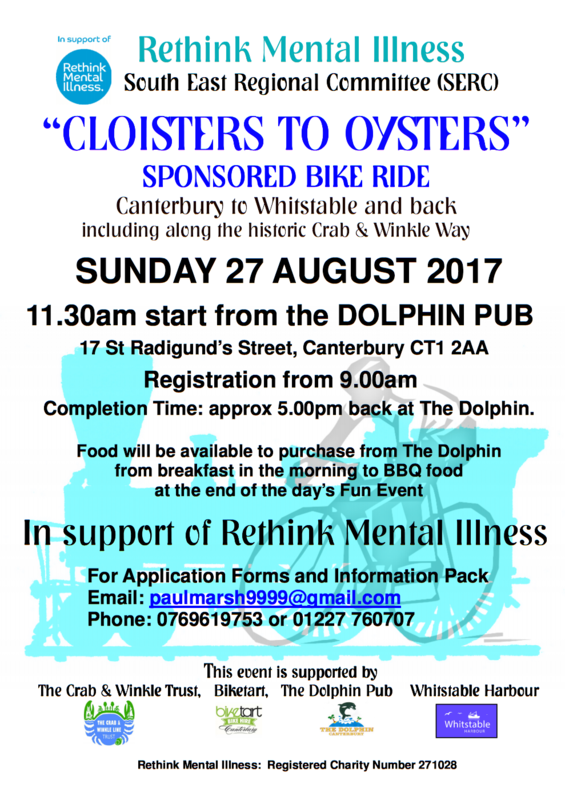 The money will be spent on environmental surveys and care of all wildlife identified on sections of the historic Canterbury-to-Whitstable railway in Whitstable. Design work will now be completed and it is hoped that construction can start later in 2017 to extend the current Crab and Winkle Way (which now stops towards the top of All Saints’ Close) to Old Bridge Road and Whitstable railway station. The land is owned partly by Kent County Council and partly by the local charity, the Crab and Winkle Line Trust, set up in 1997 to promote the history of the line and to bring it back into public use. 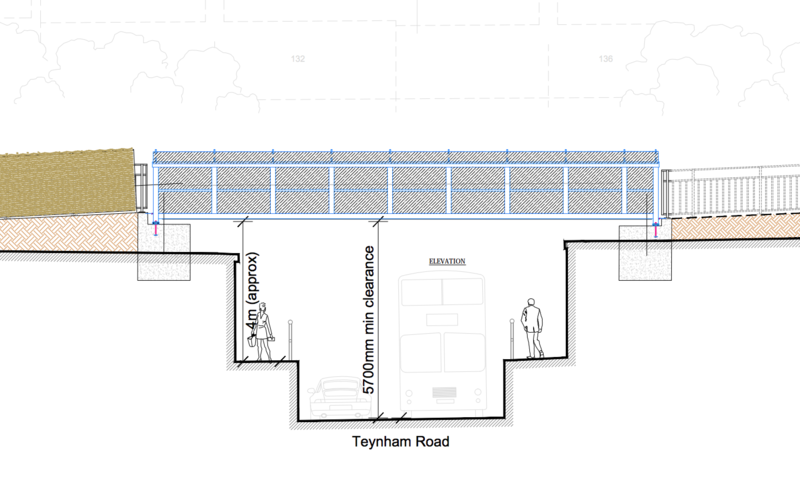 The Trust has planning approval to extend the current cyclepath and footpath towards the Harbour and intends to build bridges over Old Bridge Road and Teynham Road in Whitstable and extending the path. The section 106 money, obtained from the developers of the Huyck residential development on the Old Thanet Way, will be spent by the Council to make sure that building a low-impact footpath would not adversely risk Whitstable’s flora or fauna. Details about the Trust and its work are at: www.crabandwinkle.org. 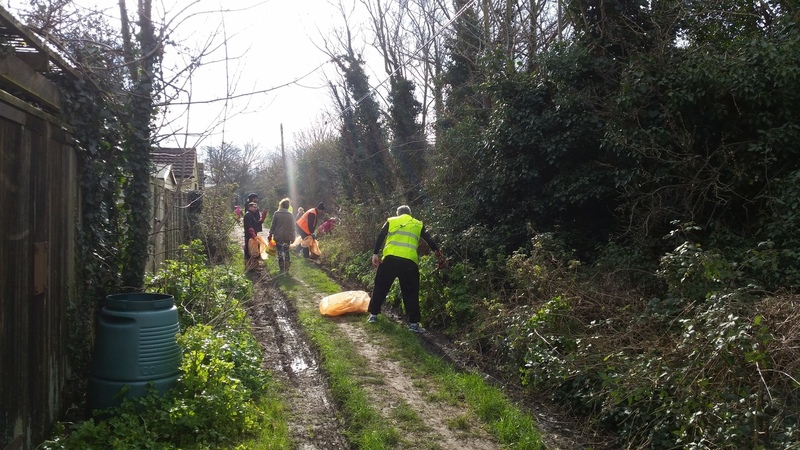 Thank you to everyone who helped at our clear-up of the Crab and Winkle embankment between Clare Road and Station Road in Whitstable on Saturday 27th Feb. Lots of local residents helped at the clear-up and helped with posting flyers. Thankyou also to Transition Town Whitstable for advertising the event and to Canterbury City Council for providing equipment and removal of the rubbish. 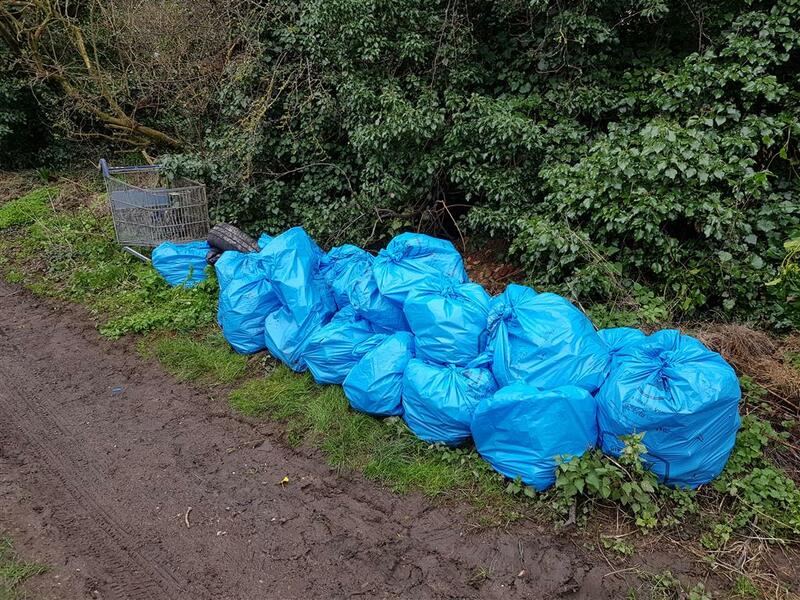 The Crab and Winkle Line Trust are organising a clear-up of the old railway embankment between Clare Road and Station Road on Saturday 27th February between 10am and 2pm. When you arrive please see a member of the trust and sign in so that you are briefed and insured. We have chosen the 27th of February as it is before the main bird nesting season. Any time you can spare to help will be highly appreciated. School age children are very welcome but must be supervised by a parent or guardian at all times. The council are providing us with gloves, litter pickers and sacks and will pick up any rubbish we collect. Please wear suitable clothing and footwear. If you have a high-vis vest/jacket and work gloves, please bring them with you as we only have a limited number available. 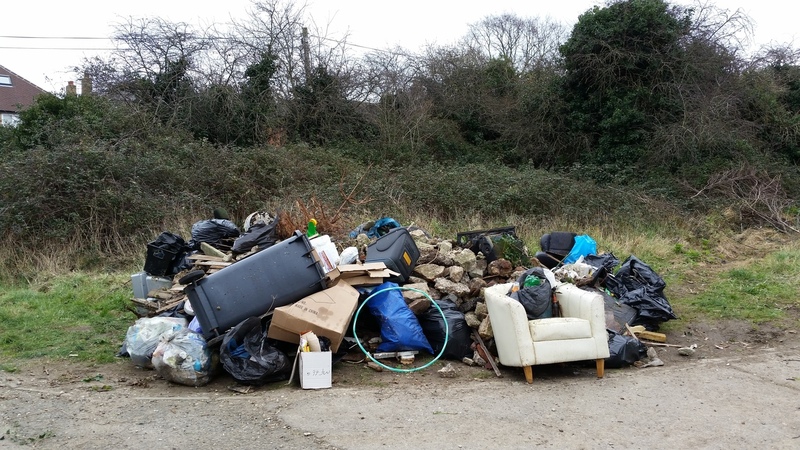 We have recently surveyed the site and have asked Serco to remove some fly-tipped material. 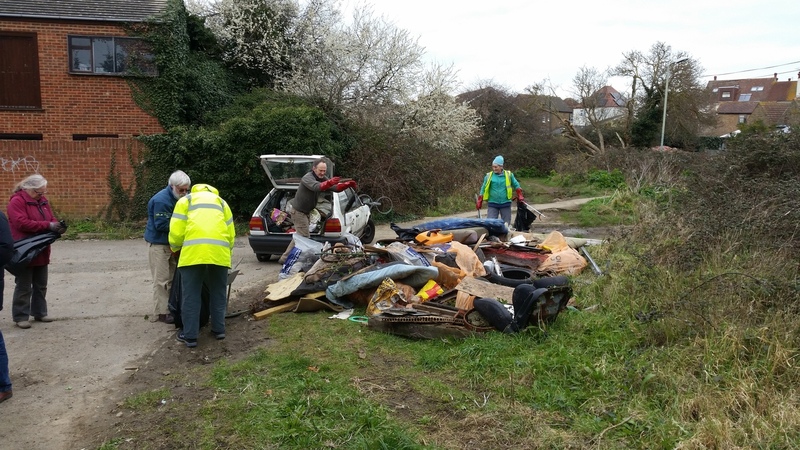 Please do let us know if you see anyone dumping more rubbish. Please join us on Wednesday 9th December from 7pm onwards at the Peter Cushing in Whitstable. It will be an informal gathering, open to all. Please do come along and chat about the line, its history, present or future uses, any ideas you may have or perhaps you would like to find out more about the trust. Last night Canterbury City Council Planning Committee removed a condition on the Crab and Winkle Line Trust’s successful planning application (CC/15/01614/VAR) to extend the Crab and Winkle Way path from the railway to the harbour in Whitstable. The condition had meant that the Trust could not start work on a path until the bridge over Teynham Road had been completed. The Committee heard residents’ concerns that the path might be built to the edge of the bridge abutments, leaving a high drop to the road beneath. The Trust has no intention of doing anything so irresponsible. We will not build any paths along the route that are inaccessible until the bridges over Teynham Road and the railway are planned and funded. The Committee heard how the Trust intends to re-submit a new planning application for the bridges next year, given that our earlier successful application has now lapsed. The new planning application will take advantage of new developments in low-level lighting and screening. All existing plans to plant thousands of new shrubs and trees along the route will stay in place. After debate and legal advice, and while recognising residents’ concerns, the Committee agreed that the Trust ought to be allowed to get on with our project to extend the popular footpath and cycle path. They commended the quality of our planning documents and agreed that the Crab and Winkle Way was an asset to the town. The lifting of the planning condition means that the Trust can now take action, where appropriate, to improve local links along the route so that they become safer and more usable.